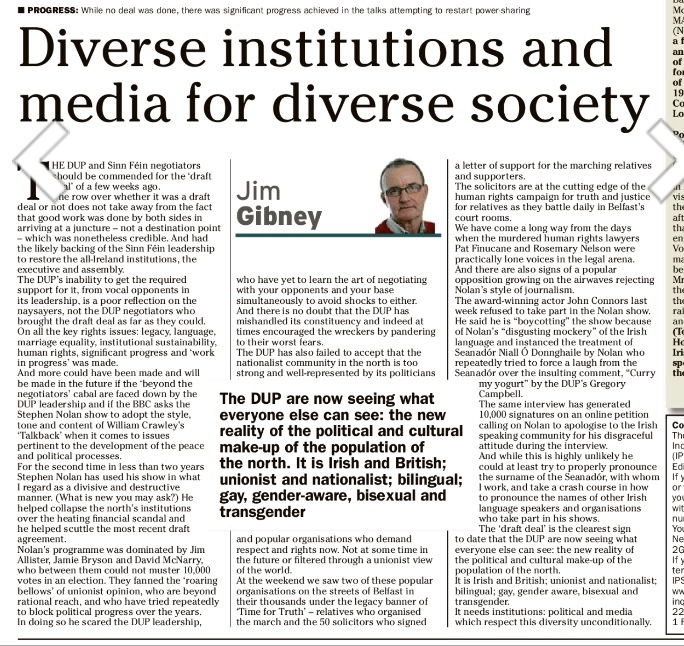 Jim Gibney’s column in today’s Irish News is perhaps the most astonishing example one is ever likely to see of a political movement trying to mutilate press freedom, and censor viewpoints which do not fit their narrative. Of course a quick analysis of TalkBack from January 29 until this week would roughly show over double the amount of nationalist and ‘progressive’ commentators, compared to unionist. Perhaps this is why Sinn Fein demand that the BBC force the Nolan Show to be “more like TalkBack”. If the Nolan Show were to be “more like TalkBack” then they would have to slash their audience in half. Perhaps the public interest journalism of the Nolan show is why they get double the amount of listeners in comparison to TalkBack. The fact that any section of the BBC is held up by Sinn Fein and the ‘progressive’ coalition as helpful to the political process, raises serious questions as to whether public interest journalism has been sacrificed on the altar of political compliance. This, however, is not even the most salient point within Gibney’s bizarre demand for Nolan to “adopt the style, tone and content” of his show. This honour is reserved for the justification for this demand, namely that this should be done in furtherance of the “peace and political processes”. And herein lies the authoritarianism at the heart of the Belfast Agreement, the proponents of which arrogantly believe that censorship and curtailing press freedom is a necessary evil in pursuit of the objectives of the so-called ‘peace process’. It appears that journalism that promotes the ‘process’, and of course is liberal and progressive enough so as to fit into Sinn Fein’s political agenda, is good and any journalism that dares to challenge the political system is bad, and should be “faced down”. Jim Gibney, of course, is only neatly articulating the Sinn Fein agenda that lies at the heart of their contrived #BoycottNolan campaign. That is to bully the media into bending to their will. It chimes with the naked intolerance that pervades throughout their allies in the Alliance party and the wider ‘progressive’ pan-nationalist coalition. Sinn Fein’s contrived campaign to target press freedom has been supported, both overtly and covertly, by a number of journalists who have allowed their jealously to get the better of them. Of course these same people, who it is unlikely anyone would ever try to censor because they never write anything of any use, would jump and skip onto the Nolan if they were invited. The appalling attack on press freedom by Jim Gibney was facilitated by the Irish News. The article makes reference to the Sinn Fein organised #BoycottNolan petition. The petition states that the television clip in question was a “recent interview”, this is plainly false. The clip referred to was in 2014, yet the Irish News did not clarify this, instead allowing Gibney to shamelessly plug the Sinn Fein agenda. It is also notable that Gibney, and by extension Sinn Fein, reserve their wrath towards contributors for me, Jim Allister and David McNarry. Nowhere is there any concerns about nationalist commentators, it appears that it is only unionists that the boycott want censored. Gibney’s piece accuses us of “fanning the roaring bellows of unionist opinion, who are beyond rational reach”. How patronising towards the unionist community can you possibly get? The positive aspect of today’s assault on press freedom is that it has highlighted the real agenda behind Sinn Fein’s contrived #BoycottNolan campaign, namely to use the campaign as a laboratory to see how far they can curtail the media when they refuse to accede to the political narrative favoured by the republican movement. The NUJ have remained silent throughout the #BoycottNolan campaign, probably because some prominent members of the Belfast branch have been encouraging the boycott, but surely now is the time that the union speaks out against the blatant attempts to target one section of the media. 99 Responses to "OPINION: Gibney’s appalling Irish News column demands a compliant media to assist the ‘political process’"
I am not rattling great with English but I line up this really easy to read . I adore reading through and I believe this website got some truly utilitarian stuff on it! . written and include almost all vital infos. I would like to see extra posts like this . am reading this fantastic informative piece of writing here at my house. Kindly allow me realize in order that I could subscribe. Thanks. to give one thing back and help others such as you aided me. Hi there! I just want to give you a big thumbs up for your excellent info you have got right here on this post. of the text in your posts are running off the screen. Can someone else please provide feedback and let me know if this is happening to them as well? lately, but I by no means found any attention-grabbing article like yours. It is lovely value enough for me. Personally, if all web owners and bloggers made excellent content as you did, the web will be a lot more useful than ever before. Hello there! This article couldn’t be written any better! Looking at this article reminds me of my previous roommate! He constantly kept talking about this. I’ll forward this article to him. Pretty sure he will have a great read. I appreciate you for sharing! I just added this blog to my feed reader, great stuff. Can’t get enough! subscribe to it. Is there anyone else getting identical RSS issues? Asking questions are actually pleasant thing if you are not understanding anything entirely, however this article gives fastidious understanding even. iphone during lunch break. I enjoy the info you provide here and can’t wait to take a look when I get home. You need to take part in a contest for one of the finest blogs on the internet. I’m going to recommend this web site! clarity in your post is just nice and i could assume you are an expert on this subject. Oh my goodness! Impressive article dude! Many thanks, However I am having problems with your RSS. I don’t know the reason why I can’t join it. Is there anybody else getting identical RSS problems? Anyone who knows the answer can you kindly respond? Thanx!! accident, and I am shocked why this coincidence didn’t happened earlier! Fine with your permission allow me to grab your RSS feed to stay up to date with forthcoming post.